I'm planning to attend the STNICCC 2015 demo party later this year, ideally with an Atari prod ready in time to participate to the competitions. Even if I'm doing most of my development on emulators, it's important for me to test everything on the real hardware! Unfortunately the hardware in question is old and prone to failures, so it's time to get it ready and fix the issues. Not everybody will agree, but for me the Mega STe is by far the best machine built by the Atari Corp.
That being said, it's not perfect, and in particular it has one major annoyance: There is an extremely noisy fan on the power supply. Fortunately, the year is 2015, and we can use modern parts to fix this old problem! To access the fan, you need to remove the top part of the case. 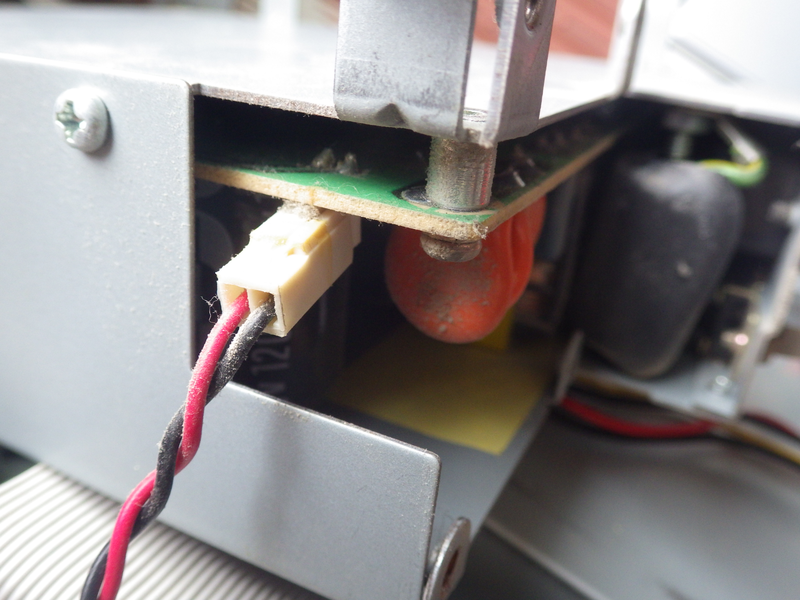 First you need to remove the hard drive compartment (one flat screw at the bottom), and carefully disconnect the molex power plug and flat cables. 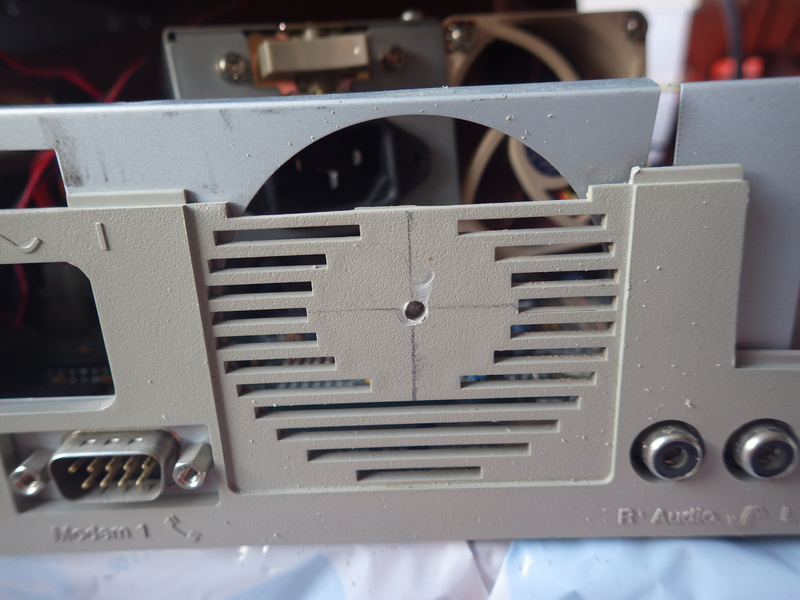 Then you just unscrew the rest of the screws that maintain the main case (these are large Phillips ones), and pull over the top carefully to avoid ripping out the floppy drive connectors. 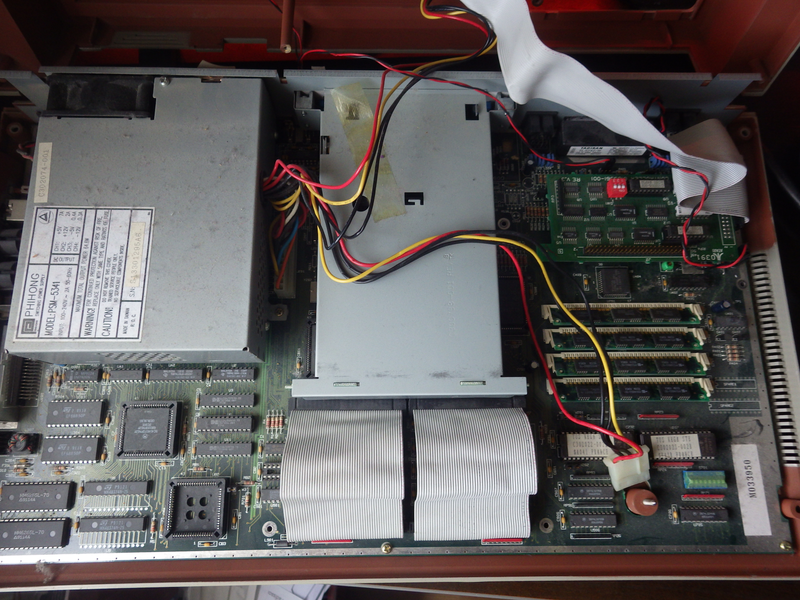 On the top left is the power-supply unit, the black part in the corner is the 60mm fan we are going to replace. As you can see the fan is a very standard 60mm, 12volt fan2. All you need is to remove the four long screws and disconnect the plug. On my machine there was glue on the plug, so you may have to scratch it away using a sharp knife. 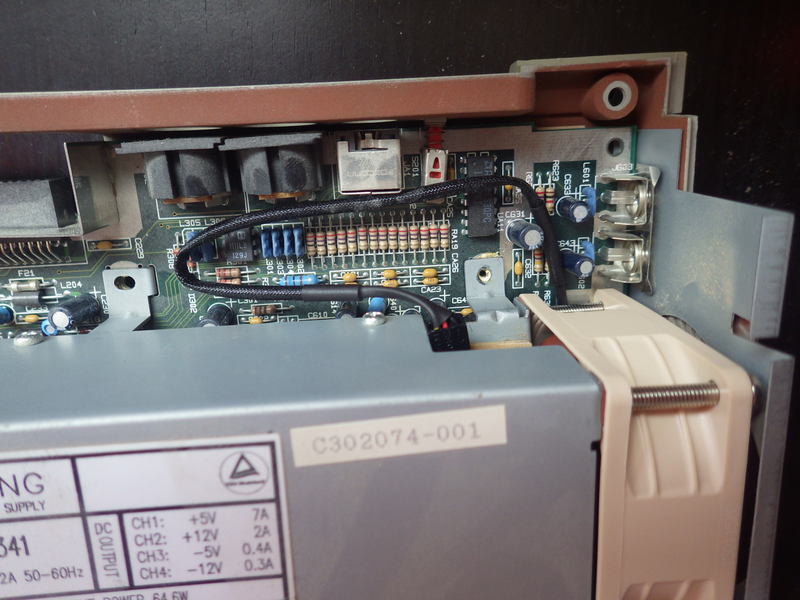 Make sure you do not twist the pins or break the solders! 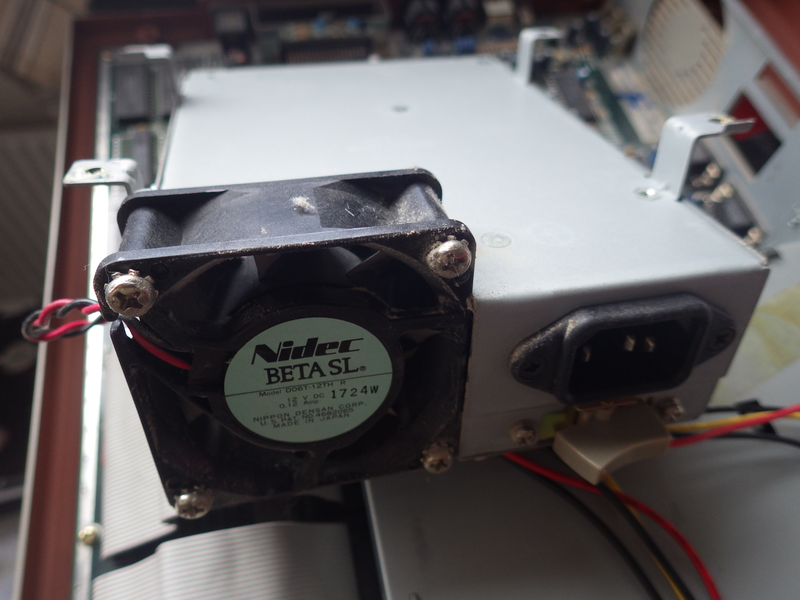 I've been building and repairing computers for quite a while, and if I had to select one common occurrence in all issues, it is that fans tend to fail: Fans on power supplies, fans on cpus, additional cooling fans, fans on the north-bridge, fans on graphic cards. They start to collect dust, the slow down to the point of being inefficient, or the ball bearings fail. The result? Noisy machines, machines that overheat, or machines that make so much noise that you don't even want to use them anymore. The bottom line: Don't buy cheap fans, use quality ones, and yes the price difference generally matters. I first discovered the Noctua brand when I was looking for a quality air cooler for my Intel Core i7 2600k; the Noctua NH-D14 kept coming in the recommendations, and even years later you can still see it with a five star ratting on newegg from more than a thousand reviews3. More than three years later it's still going strong, and is still as silent as it was on the first day. 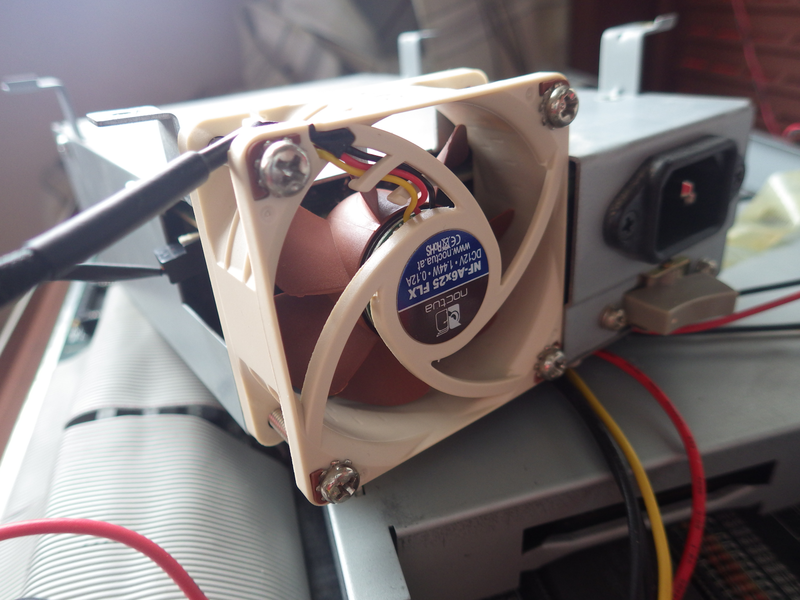 That's the reason why I decided to go again with Noctua, and bought a NF-A6x25 FLX model, a nifty small replacement fan with high quality bearings, vibration dampers, and two speed reduction cables. The difference is obvious, isn't it? Well, it should come without surprise: The installation of the new fan is exactly the reverse of the removal of the old one. The only difference is that the original connector had two pins (red and black) while the new one has three (yellow, red and black): Just make sure you connect the new fan on the red and black pins, leaving the yellow one unconnected. The new wire is longer, and slightly stiffer than the old one, but normally this should not be a problem. Just put back all the screws, switch on the machine, and enjoy a much more silent machine. At this point the machine was much more silent, and it did not have these annoying rattling noise, but it was still possible to know that it was powered. For the next step we will have to actually modify the appearance of the machine. If you look on the back, you will see that the air vents are actually very narrow slits, definitely not optimal for the air flow. Cutting the plastic away is not very difficult, you can do it with a screwdriver, a solid knife, a Dremel saw, a hole cutting sawblade, etc... the choice is yours, just make sure you don't damage the motherboard or psu when doing it. I'm planning to clean up the work and add a nice metal grid to make it final, but the result is achieved: A virtually silent Mega STe!